A friend of mine told me a story today that I just loved. She has given me permission to share it on her behalf. Shortly after becoming a believer my friend Ann (not her real name) attended her first Mary Kay retreat. She was just beginning her career as a consultant and was excited—if a little nervous—about the weekend. Shortly after arriving, the ladies were instructed to dress for dinner. Apparently, MK consultants are to wear dresses or skirts much of the time and Ann was dismayed because she had only packed jeans. She was very upset and shared her dilemma with the other ladies. Before I go further, I have to share that Ann is always dressed to the nines. Even when she wears jeans and a sweater, she looks perfectly pulled together; whereas I would look like a scullery maid in the same outfit. And don’t get me started on her fabulous jewelry. She sat in front of me on our first Sunday at our church and I spent the entire time admiring her beautiful earrings that sparkled and shone in the sunlight that streamed through the stained glass windows. She really is a marvel. So, she is very particular about what she wears and was a little nervous when several women immediately jumped into action to offer her borrowed outfits. Before she knew it, Ann was being offered a lovely skirt and jacket that matched perfectly. Just as she began to fret about what shoes she would wear (she is very particular about her shoes) someone handed her a pair of cowboys boots, which she loved. As they headed out for dinner, one of the ladies noticed that Ann seemed somewhat hesitant, despite her fabulous outfit. After receiving an inquiry, Ann admitted that she wished she had packed some more jewelry, as she only wore a simple pair of turquoise earrings and she is known for her striking jewelry. Without hesitation, this lady removed a silver turquoise cross from around her neck and gave it to Ann to wear. It perfectly completed her look and Ann was able to walk into that dinner with confidence. Despite being a relatively new believer, she knew that Jesus was the one who had ultimately worked on her behalf that evening. He knew how important her appearance was to her and that she needed to feel confident as a professional in this new situation. A different outfit would have been easy to supply but the one Ann received was perfectly tailored to her taste and her personality. Jesus does things like that all the time. He deeply cares about every single facet of our existence, no matter how small. Nothing concerning us is trivial to Him. (Psalm 139:1-18). He loves to answer our prayers in ways that will delight us if we leave room for Him to work as only He can. That was an evening Ann would never forget. She was reminded of that night earlier this week. 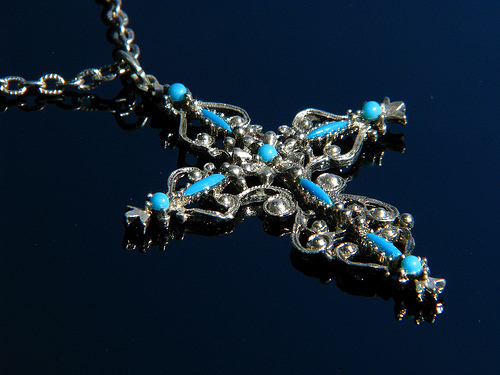 The same woman who lent her the turquoise cross became a good friend to Ann. She is moving away and called Ann to tell her she was coming by to leave her something. Ann wasn’t able to get to the door when her friend arrived and by the time she made it to the front door, the car was gone. However, there was a gift hanging on her doorknob. It was that same turquoise cross from that evening all those years ago. Tears sprang to Ann’s eyes as she held that cross in her hands. It was another message from her Savior that came at just the right time. Ann had experienced a disappointment recently. As often happens, her timing was not Jesus’ timing and she was learning to live in that tension where we so often find ourselves as we follow Him. The cross she held in her hand was a reminder that just as He had taken care of her that long ago night, He is still in full control. So, if you are in a place where you are awaiting God’s movement in your life, take heart. As John Piper has said, He is always at work in a thousand different ways that we cannot see. Thanks for the comment, Fae and I am happy to answer but it will have to wait until tomorrow if that is okay because I need to log off for the night. 🙂 I’m glad you were encouraged by the Piper quote…I just love him. Catch you tomorrow! In responding to your excellent question, I found that I was practically writing another post, so I decided to do just that! 🙂 Look for it in a day or two!